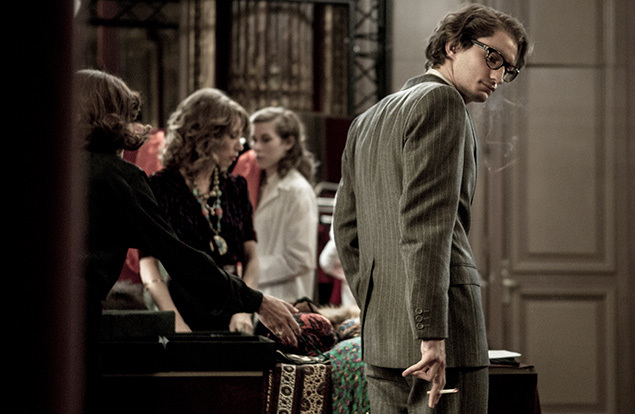 Yves Saint Laurent, the bio-pic about the French fashion designer by director Jalil Lespert, and starring Pierre Niney, Guillaume Gallienne and Charlotte Le Bon, is typical of the world of high fashion – sumptuous on the surface, but hiding a bitter core. The film follows the story of Yves Saint Laurent (Niney), from his formative years at the venerable House of Dior to the heyday of his own fashion brand YSL, and the heady days of its success during the 1970s. Yves Saint Laurent differs from the plethora of fashion based films which have saturated the market in recent years. With a few exceptions the majority of productions focusing on this cosseted world – like Mademoiselle C (2013), The Tents (2012), The September Issue (2009) and Lagerfeld Confidential (2007) – are factual as opposed to fictional. As those involved with such films work in the industry themselves, it follows that the resulting work is unlikely to divulge too many secrets. People in the fashion business are notoriously sycophantic, due in no small way to the fact that they can never tell the truth about those at its heart in fear of being blacklisted and ostracised from the shows and industry which form their livelihood. Occasionally journalists – like the Daily Mail’s Liz Jones – put their necks on the block and tell the truth. However their careers in fashion are often damaged as a result. Bio-pics on the other hand, should in theory, have no such restraints. Frequently made by mainstream filmmakers they should have more freedom to be honest. Watching Yves Saint Laurent one feels that Lespert has managed this, though the result, like the fashion world, is more beautiful on the surface than what lies beneath. The film’s attention to detail is exquisite – its depiction of Paris haute couture during the 1960s and 70s meticulous: the fascinating extras on the DVD include interviews with Audrey Secnazi (who worked for the design arm of YSL) and Violetta Sanchez (who modelled for them), explaining how they trained Niney and the models to draw and walk authentically. Dig deeper though and the picture is not so pleasant. Saint Laurent himself is portrayed as a king at the head of an empire – a volatile and highly gifted man, but completely out of touch and incapable of dealing with the real world. This was left to his business and real-life partner Piere Bergé (Gallienne), the man who clearly saved Saint Laurent from the worst excesses of those around him. Though visually stunning, Yves Saint Laurent‘s deeper story is unfortunately not as attractive.